I have been anxious lately, though. Too anxious for my liking. This is the scripture that I turn to when this happens. It reminds me to live fully for today. Oh yeah, and don’t forget to make this pie. And then bring me a slice. Pretty please? How do you live fully each day? Hope your week is full of love and laughter and butter! !hanks Cassie for this reminder to make the most of our time. We can sometimes get caught up in things that are time wasters, like dwelling on things we cannot change. Have a great afternoon! I’m with you, Cassie. I’m so ready for a break next week. SO READY. I was feeling that way a couple weeks back. I was in need of some major unplugging and Easter weekend did that for me. Thank you for sharing this verse, I love it. Right now – this is my motto as well. My life feels so upside lately all I can do is take it one day at a time, take care of what I can take care of then, let go of everything else, and enjoy the task at hand. Sometimes it’s easier to find joy in those tasks than others, but I’m only human after all! One of my favorite texts – so glad someone else is in control and has a plan for our lives! Hope you get some extra time to breathe this week, Cassie! 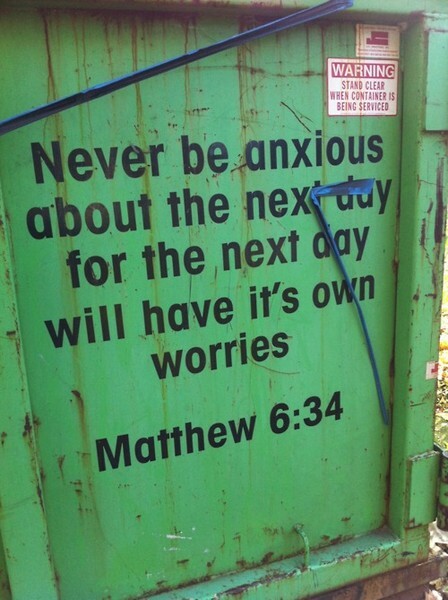 Great verse. And definitely something I needed to be reminded of. I’m always so anxious to get to the next day but sometimes I just need to take a step back, breathe, and see what’s important. i hope you’re having a fantastic day!! What a nice sentiment to keep in mind! This so goes along with my constant desire to not spend my time wanting what I don’t have, but instead to appreciate what I do have. It’s so important to appreciate life in the present! Thanks for sharing, Cassie. Sometimes I get annoyed and think, “well what the heck is tomorrow going to bring then?!? !” Sigh. I’m working on my bible study right now, and I actually feel rather calm. Which is rare because I feel anxious, often. Hope whatever anxiety you’re feeling doesn’t last too long! This is so true and great minder – thank you for sharing Cassie!